We are hoping to run a coach to Welling on Saturday 21st November. The price is £29 for Trust members, £34 for non-members and £22 junior members. The only pick-up point will be from Haig Ave at 9.30 am. The usual modes of booking apply, call into the Trust office this Saturday, or contact us via Twitter, Facebook or phone/text 0786 141 6859. The sooner you book, the sooner we can make the decision as to whether it is viable to operate the coach. Just to give you all a quick update on how things are progressing. Looking like it'll be a cracking night. For those that have asked Food WILL be served during the evening at no charge. There will be loads of entertainment and things to do throughout the evening so please, everybody come down, have a good time but most of all LETS RAISE LOADS OF CASH!!! There will also be a bucket collection for Marie Curie at the match. Thanks to Dave Barnes who has blocked up the access point in the Trust office from where the recent break in occurred. The Trust In Yellow username is now up and running on Portchat. The Trust has available funds of £24,974.58 and another £250 will be paid to McMillan Cancer from the sale of paintings at the Reunion. Around £15,000 of this has been aside for the remaining contribution to the floodlights project (£7174 has already been paid). Final confirmation from Charlie Clapham is awaited before the exact amount owed will be known. All remaining monies have been transferred into the savings account. Membership currently stands at 227 which is the highest for some time. The Trust board discussed specific roles and responsibilities for each member to ensure the smooth running of the Trust and so that general members will have an idea of what each person does. It will also make things easier when advertising for new board members whereby those interested can see what vacancies there are and whether it would suit them. Each board member will take on at least one role and these will be put on the Trust’s website along with updated profiles in the near future. The position of Welfare Officer and other possible officers will be discussed at the next meeting. The next event is the Mark Heaton Tribute evening which Howard has put a huge amount of effort into organising. There will be a professional DJ and singer as well as a raffle with all proceeds going to Marie Curie. The Grandstand Bar is expected to be at capacity for what promises to be a fantastic evening. Noel is heading up the organisation of the Christmas Party in December which will be family focused. The event will include party food and games, an appearance from Santa and presents for younger supporters. After an approach from Colin the Parker Brewery in Banks has offered a three hour tour to small groups of Trust Members. A date for this will be arranged in the near future and offered to members. Events in the pipeline for after Christmas include a Fifa Night and an evening to celebrate the 50th anniversary of the 1965/66 FA Cup run. Details about these events will be released nearer the time. The Trust is also going to launch a badge competition involving local schools as part of next year’s 10th anniversary celebrations. There will be a prize for the winning designer of the Trust's new 10th anniversary badge. Alan has done a lot of work in preparing entry forms to be sent out to schools. A discussion took place of how else the Trust could look to raise funds; included amongst those things mentioned were increased promotion of the webshop and a possible relaunch of the lottery. The Trust board decided that the next project should be something smaller than the floodlights project. The three areas that were decided to be looked into were refurbishment of the toilet facilities within the ground, improved disabled facilities and a bar inside the ground. As well as letting members decide which area they would like to see developments in, a meeting with the club will be sought to discuss the pros and cons of all of these projects and a realistic timescale for their completion moving forwards. Something else which will also be put to the club is the possibility of hiring somebody part time with money from the Fans Fund Small Grant Scheme. This person would work from the club during the week and would be available to communicate with supporters on behalf of the Trust and the club. The coach to Salford was full to capacity and received positive feedback from those travelling. However one member had suggested that seats should be allocated. It was agreed that this wasn’t practical, but if somebody specifically expressed that they required seats next to a family member or friend then we would make every effort accommodate their request. Unfortunately there were not enough bookings received for the Gateshead coach to run although this match was later postponed. Overall the coaches have run at a £100 loss for the season thus far. It was decided that the weekend destination will be either Lincoln or Torquay with the choice of the final destination being put to members. Andy agreed to supervise the ordering and delivery of signs with Autograph Signs. 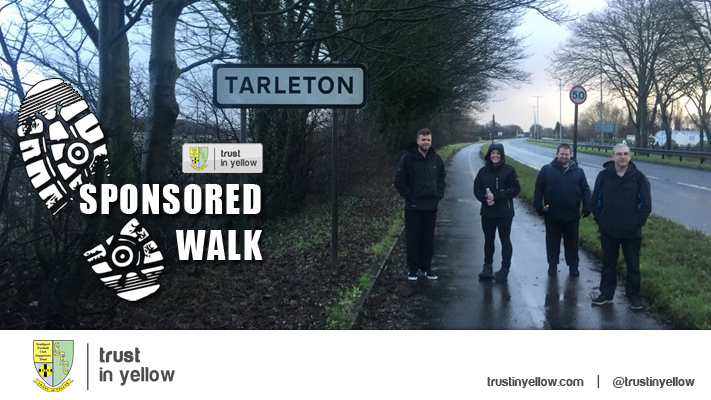 The Trust wishes to revamp the next match signs to improve their visibility and effectiveness. It was also agreed that new locations would be sought for the existing signs as at least one of them is very hard to see in their current location. 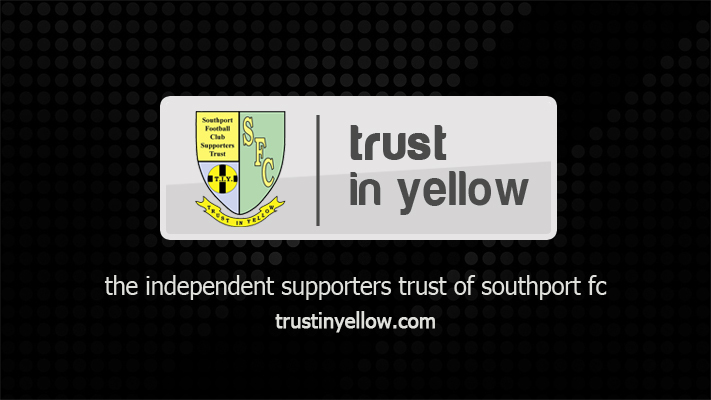 Trust In Yellow is to feature prominently on the newly launched Sandgrounder Radio with Noel being the ‘voice of the Trust' in a weekly slot. The profiles page on the website will be updated shortly with Phil Carder remaining as a lasting tribute to his contributions. 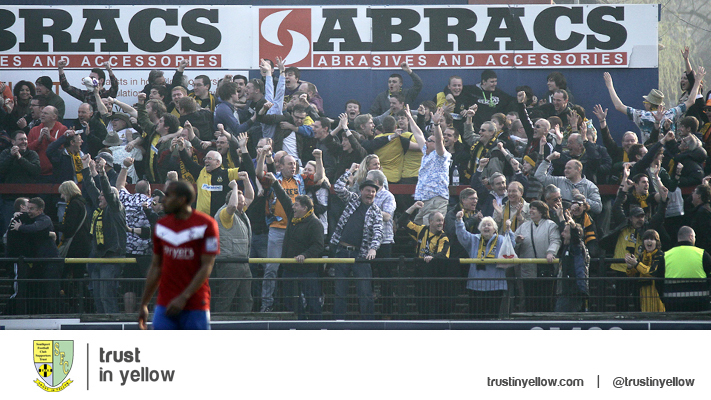 Alan has produced a Trust 10th anniversary calendar will be launched for 2016 with each month containing a photo of a memorable match or event since the formation of the Trust. 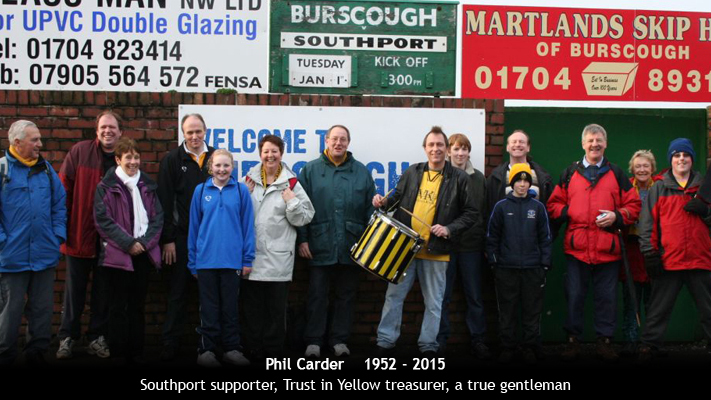 Trust in Yellow will this week be launching a new Southport FC calendar for 2016 which goes on sale from Saturday. The calendar is a limited edition with only 50 copies available, each for the special offer price of £6. 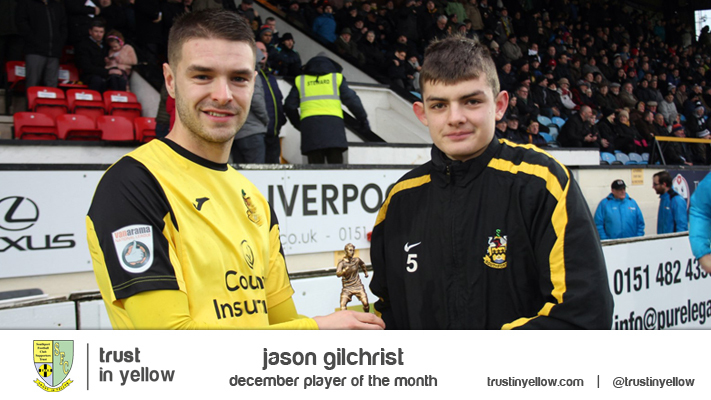 It is a great buy for all Southport fans for the year ahead and would also make an ideal Christmas present. 2016 is a very special year for the Trust, as they celebrate their tenth anniversary. And to mark this milestone year, the calendar looks back at a selection of highlights on the pitch since the Trust was formed in 2006. 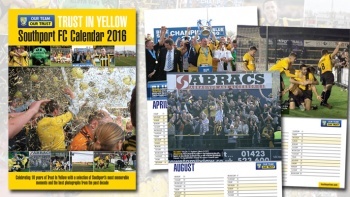 The calendar features a range of moments from the past decade, such as the epic Conference North championship win in 2010 and memorable matches including the FA Cup ties against Sheffield Wednesday, Dagenham & Redbridge and, most recently, Derby County. It also includes some of the best photographs over the past ten years. Among the players featured are fan favourites Earl Davis and David Raya Martin, and there are a number of crowd photos which could well feature you. The calendar will be available from the club shop and Trust in Yellow office from next Saturday. It will also be on sale to order online and details will be confirmed shortly. The calendar features photography from, among others, Julia Urwin, Sally Devine, Simon Marshall and Craig Galloway.With only 50 copies available, it is a limited edition product so please don’t delay buying it.